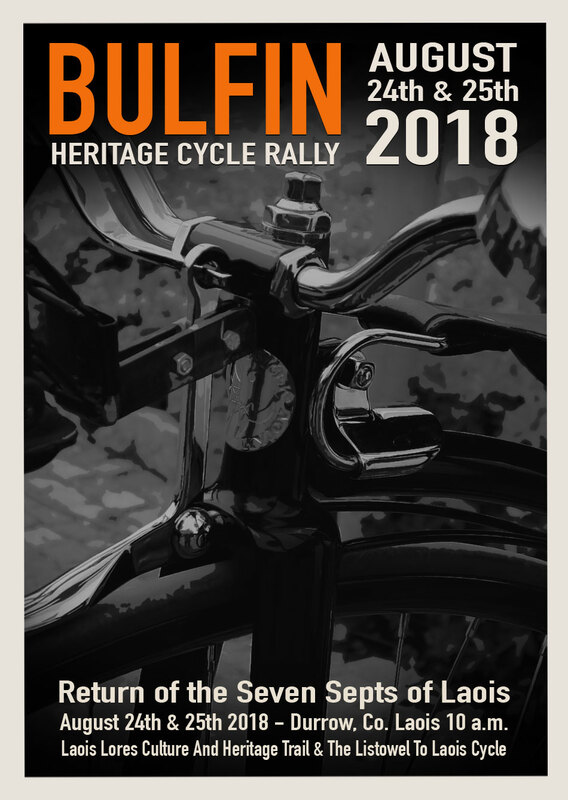 The Bulfin Heritage Cycle Rally 2018. ….. is a merging of two separate cycles, at the Rock of Dunamase, in Co. Laois. A Laois “Lores & Legends” Trail – Learn the amazing story of “Laois Sept -Rebel, Rory Óg O’Moore. It’s a 60 KM, two Day Event, on August 24th & 25th 2018, and is a Vintage Bicycle / High Nelly Cycle, through the rolling countryside of County Laois. To explain more – It’s about parking the mountain bike, the 24 gears, the carbon fibre, the racer, and mounting a bicycle from another era…something made of steel…maybe even something a little bit rusty! It’s about dressing up for Ancient Ireland, sharing our heritage in the company of our overseas guests and generally enjoying the Craic. Whether you cycle on an old time butcher’s bike, a restored High Nelly charmer, with a stylish wicker basket, a 40’s or 50’s Raleigh, or a modern replica, it doesn’t matter. What does matter, is that you get involved in a novel heritage event where cycling is only part of the fun. The Listowel to Laois Cycle Challenge – “7 Septs of Laois Torch Relay” from North Kerry to Laois. To light a ceremonial Laois Septs Family “Vessel” at the Rock Of Dunamase. To explain more – For many centuries before its plantation by the English, and it’s renaming as Queens County, Laois was under the control of the Seven Septs (Local Clan Families). Following many bloody battles, the surviving members of the Septs were transplanted to Kerry, being under sentence of death should they ever return to Laois. The Septs were established in Kerry as tenant farmers under their landlord, Patrick Crosbie. Descendants of these Sept families remain in Co. Kerry, down to the present day. To mark the 2018 European Year of Cultural Heritage, seven torches, each representing one of the Seven Laois Septs will return to Laois, in cycle convoy, to light up a “Ceremonial Laois Sept Vessel” at a special Heritage gathering at the Rock of Dunamase. The Seven Laois Sept Families were – Moore’s, Devoy’s (Deevy’s / Dee’s), Dowling’s, Doran’s, Kelly’s, Lalor’s, McEvoy’s.